First off, a quick Power Rangers primer, as the background story of the franchise is probably more interesting (story-wise, at least) to an adult than the show itself is. Power Rangers is an adaptation of a super-long-running Japanese franchise called Super Sentai, which started in 1975 and is still going today. 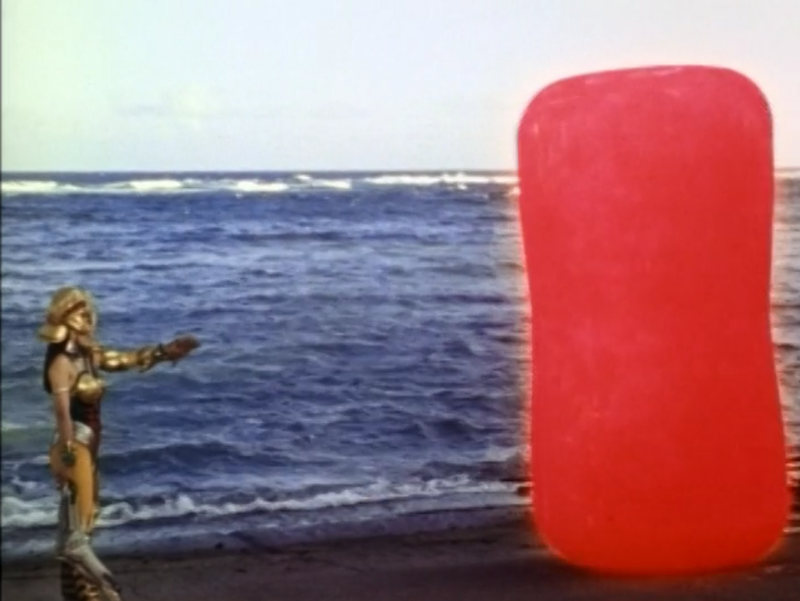 In the various Sentai series (created by the Japanese company Toei), people get powers that allow them to transform into color-coded ninja acrobats to fight evil, and when the going gets tough (say, a Godzilla-sized Kaiju shows up) they call upon a giant mecha to even the odds. An easy enough concept that could clearly work well in the American market. Except… to do a whole live-action show like that with evil monsters and giant robot fights would probably cost too much money for a kid show in America. Too much money, that is, unless you could just reuse somebody else’s work and then just use local actors to fill in the blanks for when there aren’t monsters or robots having throwdowns. 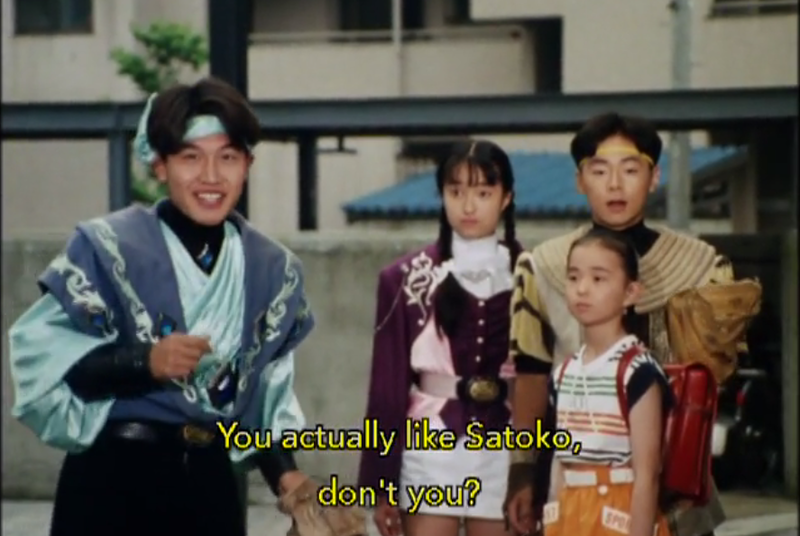 In the early 1990s, the Saban company realized this, and licensed the Sentai series Kyōryū Sentai Zyuranger. Most of the scenes involving costumed ninja-acrobats or giant monsters/robots would be ripped straight from Zyuranger, while the scenes involving the heroes in their civilian identities would be done by actors in California. 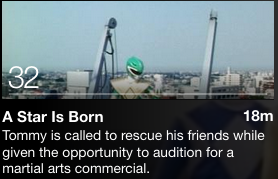 And thus, the Mighty Morphin Power Rangers were born! And as time went on, further Sentai series were brought over and Power Rangers-ized, representing either the evolution of the team or whole new teams of Rangers all together. So, anyway, Mighty Morphin Power Rangers (or MMPR). The set-up is simple: “teenagers with attitude” were chosen by the God-like floating head of Zordon to become the Power Rangers, defending Angel Grove, California from the evil space-witch Rita Repulsa. When the going gets rough, they call in dinosaur robots called Zords that can combine into a super robot called the Megazord. Jason Lee Scott AKA the Red Ranger. 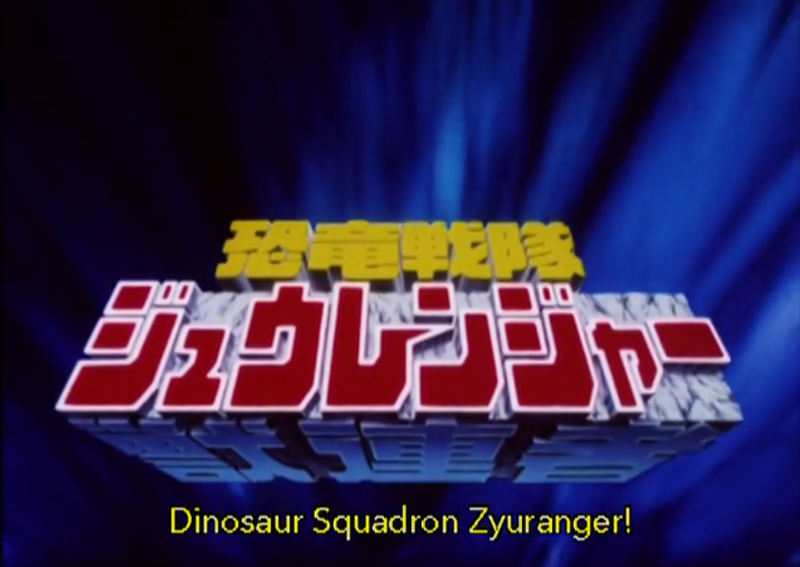 The team’s leader and pilot of the Tyrannosaurus Dinozord. Portrayed by Austin St. John, who would later become a paramedic in the real world. Zack Taylor AKA the Black Ranger. Prankster, hip-hop artist and the pilot of the Mastodon Dinozord (never mind that a Mastodon isn’t a dinosaur). Portrayed by Walter Jones, it was apparently unintentional that the team’s lone African-American was the Black Ranger. Billy Cranston AKA the Blue Ranger. The team’s resident genius and pilot of the Triceratops Dinozord. Portrayed by Billy Yost, the character’s last name of Cranston was actually a reference to a then-unknown actor who did voice-acting for the show: Bryan Cranston. Trini Kwan, AKA the Yellow Ranger (I’m not color-coding that because it’d be hard to see). Pilot of the Sabertooth Tiger Dinozord (again, not a dinosaur, but what the heck), like the Black Ranger it was apparently unintentional that the cast’s only Asian would be the Yellow Ranger. Portrayed by Thuy Trang, who would tragically die in a car accident in 2001. Kimberly Ann Hart, AKA the Pink Ranger. Gymnast, artist and pilot of the Pterodactyl Dinozord (again, not a dinosaur, but at least closer than the Mastodon and Sabertooth). Portrayed by Amy Jo Johnson, who has had by far the best post-Power Rangers career of the original cast. Tommy Oliver, AKA the Green Ranger. Not originally a member of the team, the martial arts master was originally an evil Power Ranger controlled by Rita Repulsa before turning to the side of good. 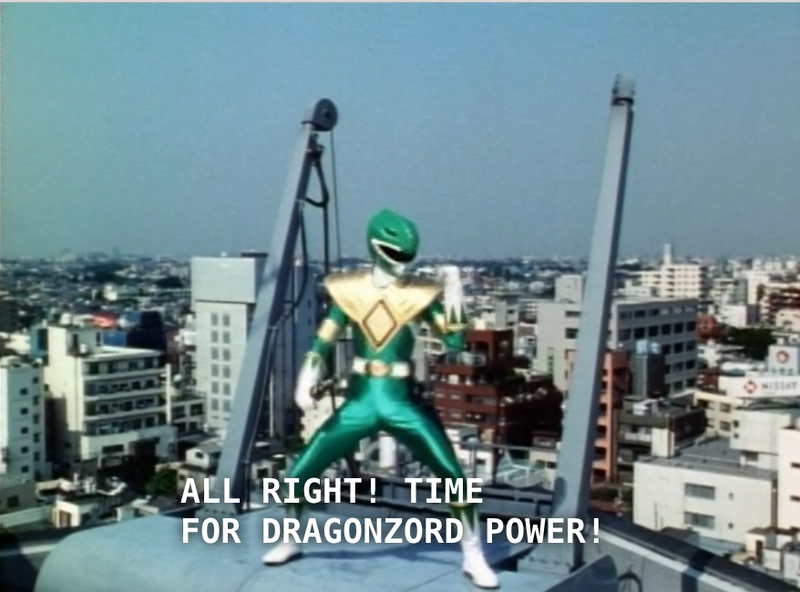 Controls the Dragonzord, which is sort of like the other Zords, but also sort of separate. Portrayed by Jason David Frank, Tommy would become a mainstay of the franchise and Frank was portraying him as recently as 2015. Okay, now that all of that is out of the way… “A Star Is Born”. Which, interestingly enough, actually has almost nothing to do with baseball other than the monster. The “star” being born isn’t a baseball star, but rather acting/karate. Again, Power Rangers was awesome/horrible. Anyway, while this standard 1990s after-school TV show stuff is going on, Rita Repulsa is up on the Moon, feeling “pooped” and wanting a day off. 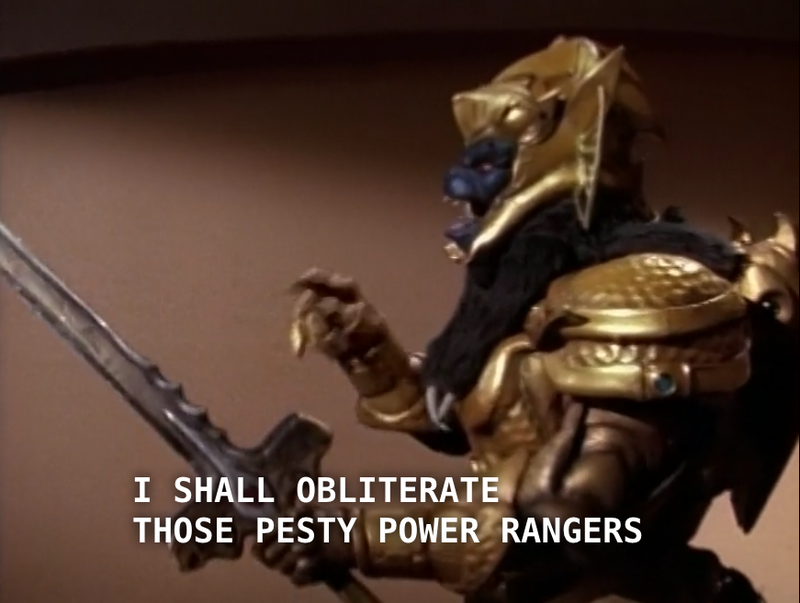 No, seriously, she even says that, even when her Griffin/lion-man henchman Goldar implores her to lead them to victory. And so, Goldar just says “fine, I’ll do it”. Also, the scenery in this fight looks more like Japan than it does California. Oh, and Tommy isn’t available because he’s doing his audition and left his communicator in his green-colored backpack. Say this for the Power Rangers: the ways they came up with to neutralize the fact they all had communication devices that would allow them to easily call each other for help were years ahead of the standard “why didn’t they just use their cell phones” arguments of today. Or something like that. 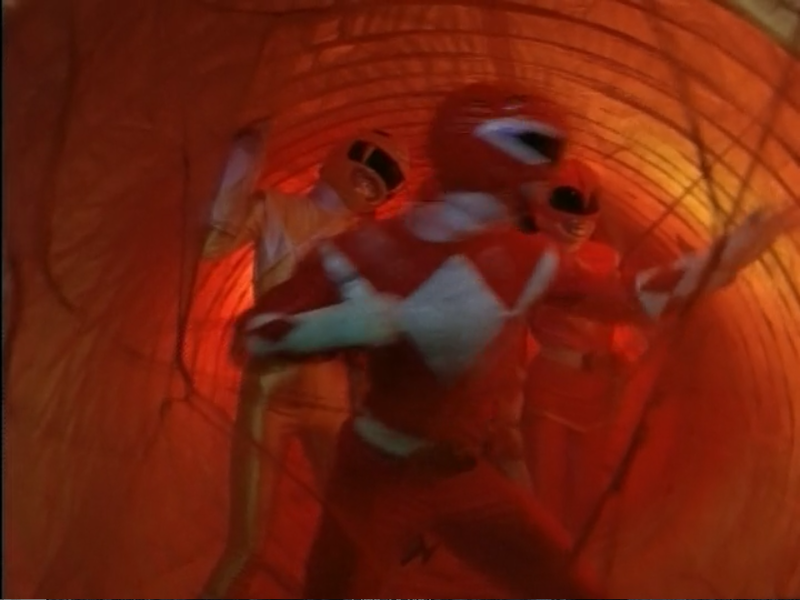 Of course, the Power Rangers just get out of the cocoon on their own with the brilliant strategem of shooting their weapons. 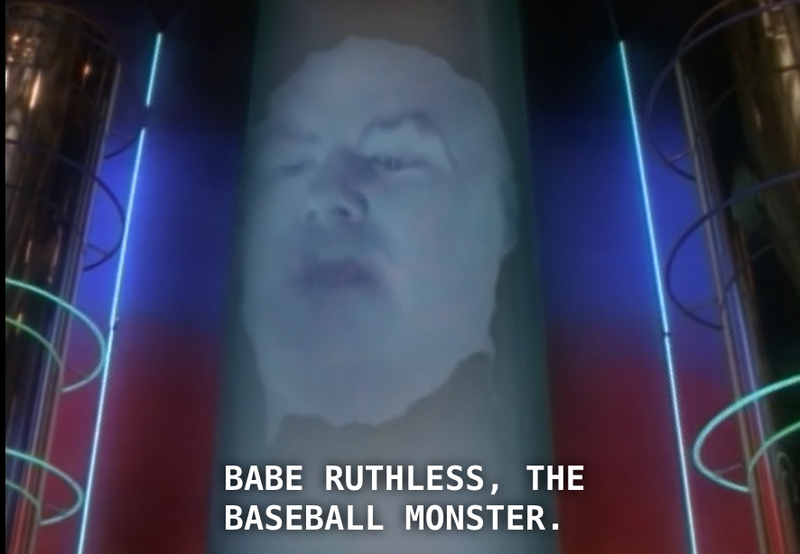 Zordon orders his robot lackey Alpha to immediately teleport them to their zords to fight… “Babe Ruthless, the Baseball Monster”. When did Babe Ruthless show up? I don’t know, but when the giant floating godhead says that “Babe Ruthless, The Baseball Monster” has been sent down… YOU LISTEN. Okay, so, let’s see here. 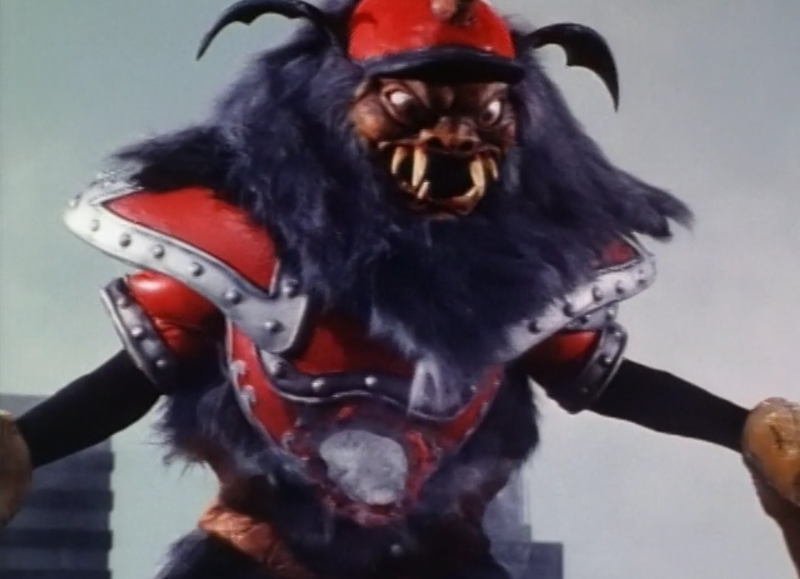 Babe Ruthless is the baseball monster because… he has a baseball hat, a baseball name, and has baseball mitts for hands. Oh, and he seems to have bat wings for ears and sort-of has vampiric teeth, which I guess could serve as a pun on “bat”. But other than that, Babe Ruthless isn’t all that baseball-like. It looks like he’s wearing some sort of (American) football padding, and there isn’t a single thing below the belt that implies baseball in any way whatsoever. His legs and hooves look more like a Greek god than Babe Ruth. He also has a weird broken horn sticking through his hat. Other things he yells include “Try my Curveball!”, “Batter Up!”, and the like. 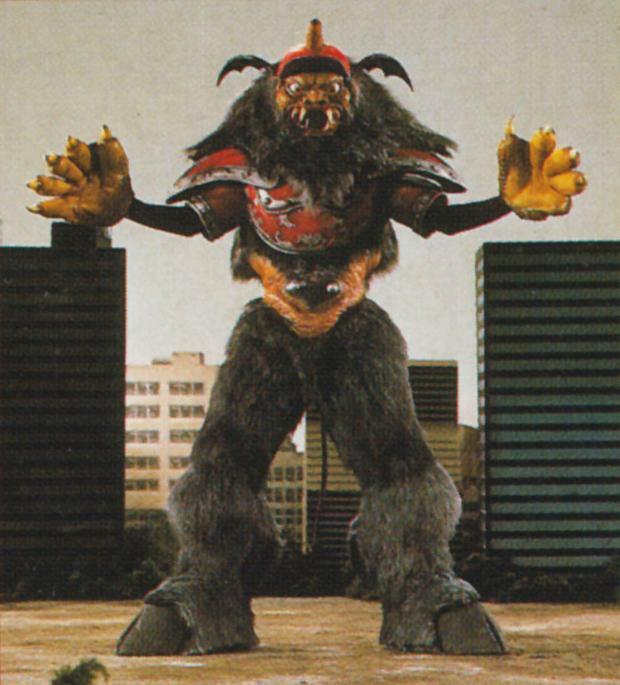 By the way, one thing that always differentiated Power Rangers from other giant-monster franchises is that the monsters would talk. You never heard Godzilla talk. Well, other than that one time. 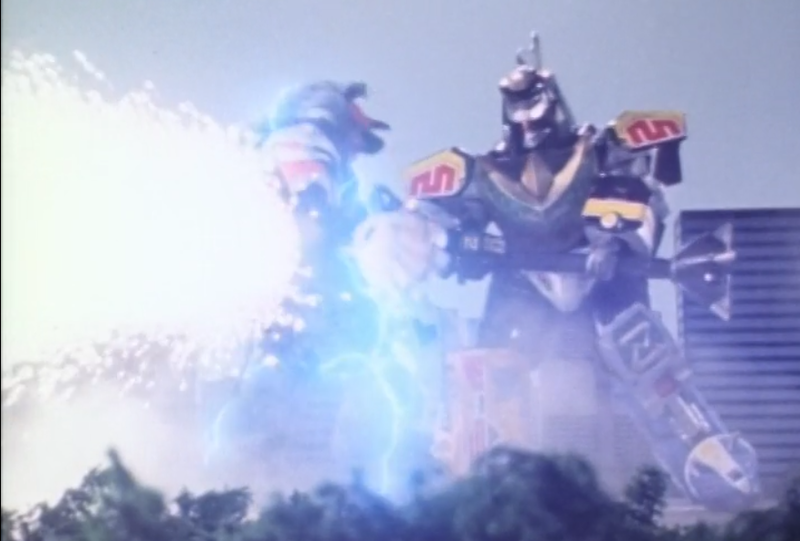 Anyway, what happens next is something I don’t remember happening much when I was watching as a kid: the zords don’t automatically combine into a Megazord, but rather fight separately, with Jason’s Tyrannosaurus Dinozord doing most of the heavy lifting while the others shoot lasers into the battle occasionally for support. They fight. 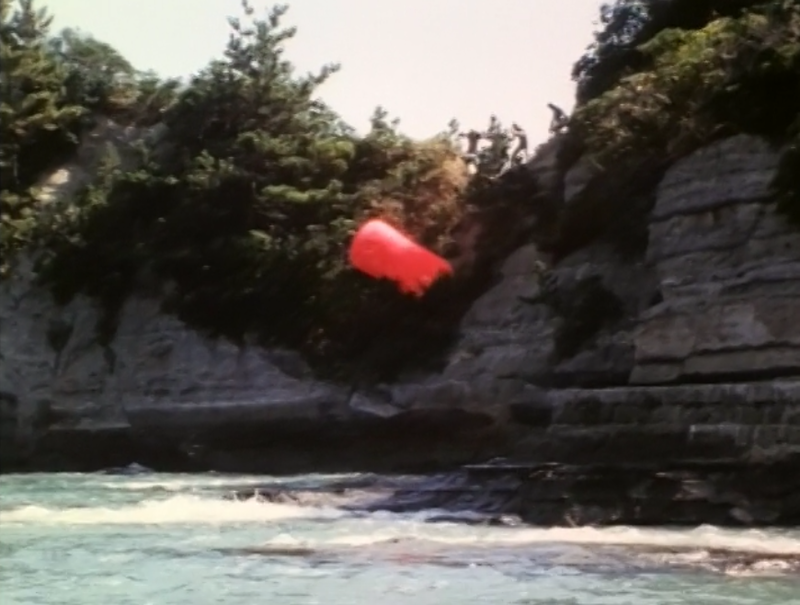 At one point Babe Ruthless conjures a red ball out of thin air and throws it at the Rangers, but the Tyrannosaurus Zord (being operated remotely) hits the ball with its tail right back at the baddies. Get it, like it’s a baseball being hit? 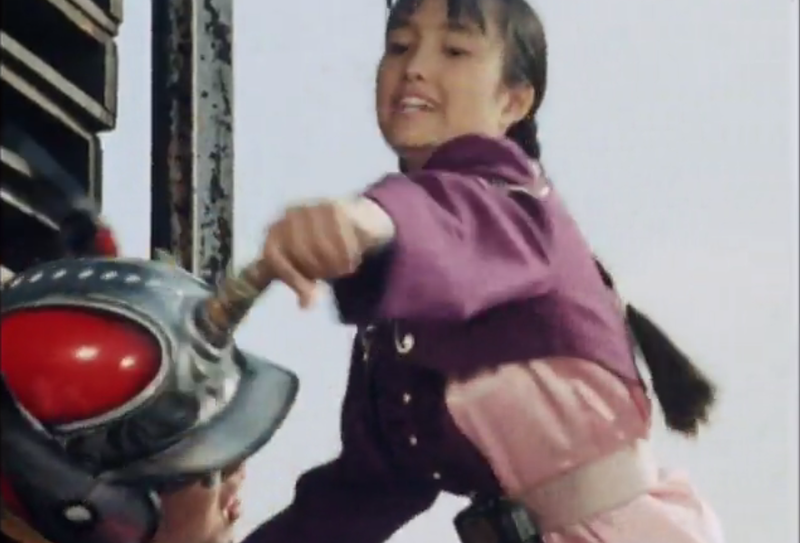 Finally, in what is likely the most metal thing to happen in the history of Power Rangers, if not the history of Bizarre Baseball Culture, the Dragonzord kills Babe Ruthless by impaling him. Needless to say, that is the end of Babe Ruthless. It is then that Scorpina calls up her big silkworm monster again, and then the Power Rangers do the more traditional Megazord transformation. The silkworm then again cocoons them, but the Dragonzord sets them free, at which point the Megazord and Dragonzord combine into the Mega Dragonzord (which is exactly what you think it is). 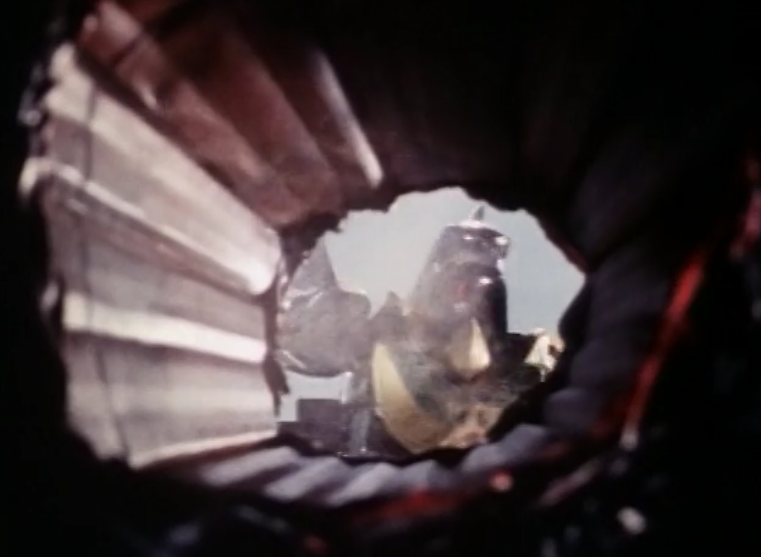 The Mega Dragonzord makes quick work of the silkworm, which the Wiki tells me was actually called Weaveworm. And so, the day is saved. Rita rips into her henchmen for screwing up on her day off, and back on Earth, that karate commercial airs: both Tommy and Bulk are in it. 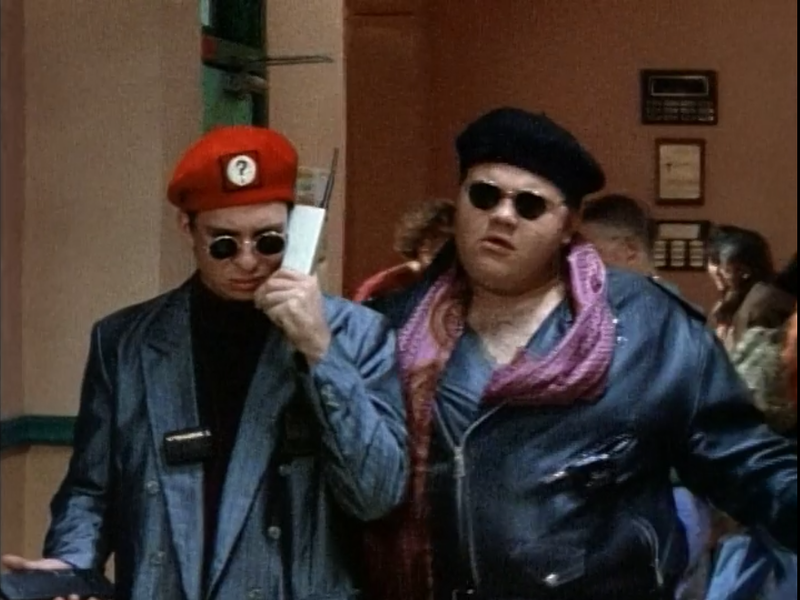 Bulk is the “before/what not to do” example, while Tommy is the “after/what to do” example. Ha! And so ends “A Star Is Born”, which inexplicably introduces a baseball-themed villain for like four minutes during an episode that is otherwise about a magic silkworm, karate, and goofing off while the boss is away. Why would it be so randomly introduced? Oh, wait. We can! ShoutFactoryTV is streaming it! Instead of being ordinary modern humans given powers by a floating god-head, the Zyurangers are ancient humans from the time of the dinosaurs (don’t think about it too hard) who have come back to defend Earth from the Witch Bandora (or, as we call her, “Rita Repulsa”). The Yellow Ranger is actually a dude (this explains why in Power Rangers the Pink Ranger has a skirt but the Yellow Ranger doesn’t, apparently). Goldar (called Grifforzer here) and Scorpina (called Lamy here) are married. Instead of a floating god-head giving them advice, it’s just an old wizard/sage called Barza. The Green Ranger is the Red Ranger’s brother, and after being freed from the evil spell was cursed to live in a sort-of phantom zone, as every moment he is outside of it he is doomed to slowly die from a spell, or something. Now, let’s take a look at the Japanese episode that inspired the Babe Ruthless segment of “A Star Is Born”. It is episode 23, loosely translated as “The Knuckleball of Affection”. 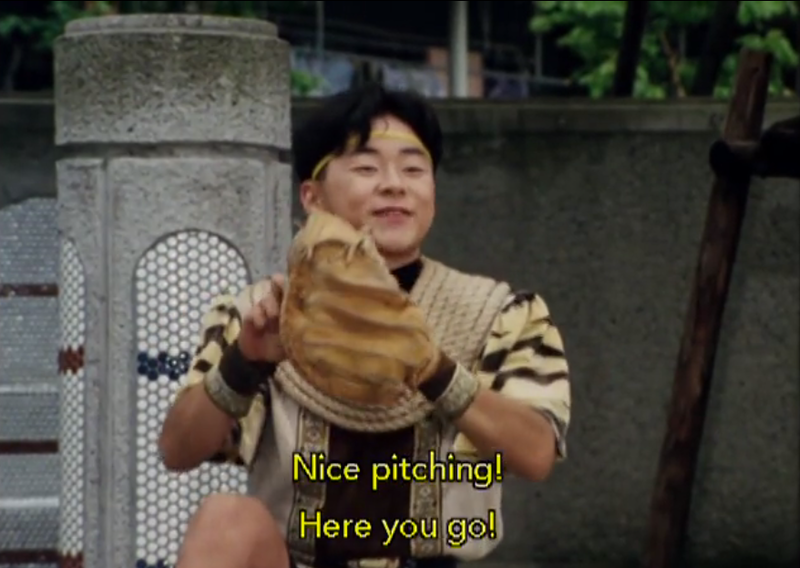 I include the above picture simply because of the image of ancient Japanese dinosaur-warriors wearing baseball gloves continues to be hilarious, bizarre, and awesome. Huh, I thought he’d be bigger. Obviously, this is the little version of the monster that we know as Babe Ruthless. 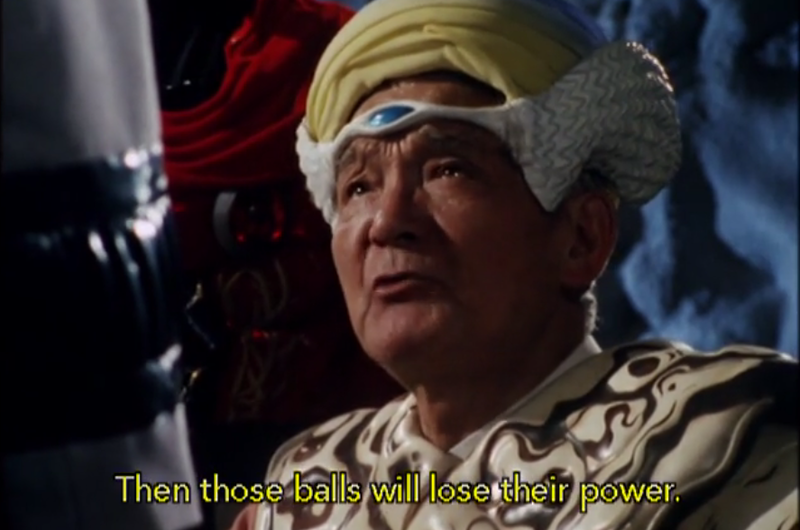 You can see why the Power Rangers people wouldn’t/couldn’t make him the overall villain. 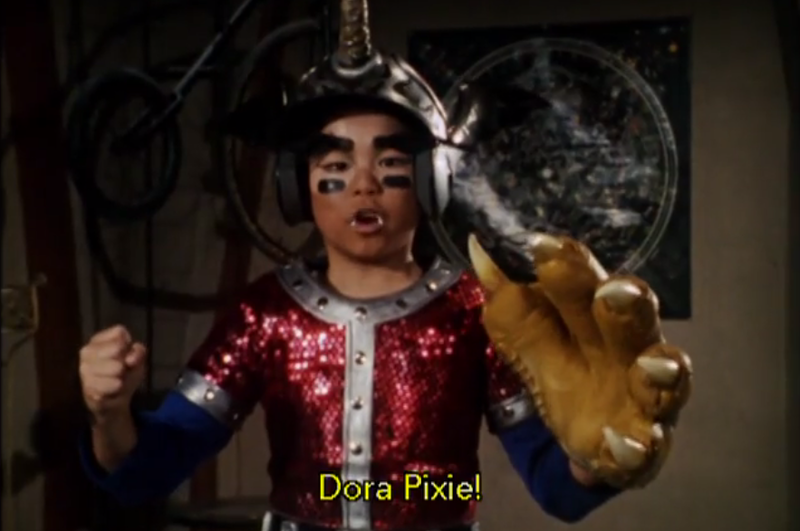 Dora Pixie’s power is… uhh… weird. He throws balls/pills of some sort of enchanted love potion at people. His great Greg Maddux-like accuracy means he always gets it right into the mouths of people, causing them to fall in love with the first thing they see. Yes, that is a little girl who has fallen in romantic love with an airplane. Similar things happen to people with cars, a dog, a pole, a telephone booth, a motorcycle, and a wall. This show is so weird it makes Power Rangers look normal. The ZyuRangers show up, of course, but before they can fully transform the Pixie is able to get the Yellow and Blue ZyuRangers to fall in love with the Pink one. This causes everything to fall apart and the evildoers are able to escape. So, with two of the team out of action and the Green Ranger stuck in his special zone due to his curse, the three go out and try to break the horn on their own. 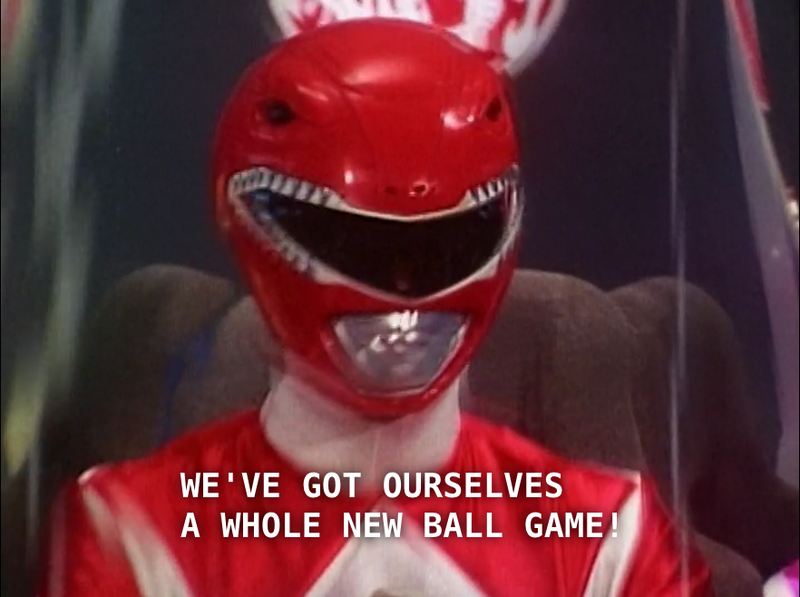 Sadly, this goes badly, and the Black Ranger gets whammied by the love-ball, falling in love with his motorcycle. So with just Red and Pink remaining, they decide to split up: Pink is to go find and break Pixie’s horn, while Red will take over the “Guardian Beast Tyrannosaur” (Tyrannosaur Dinozord) and fight Grifforzer/Goldar and Lamy/Scorpina, who have grown big and attacked the city. This, presumably, is why the start of the fight with Babe Ruthless, Goldar and Scorpina in Power Rangers at first only features the Tyrannosaur Zord, with the others off-screen sending help occasionally. And that, kids, is why Babe Ruthless’s hat/horn is broken. 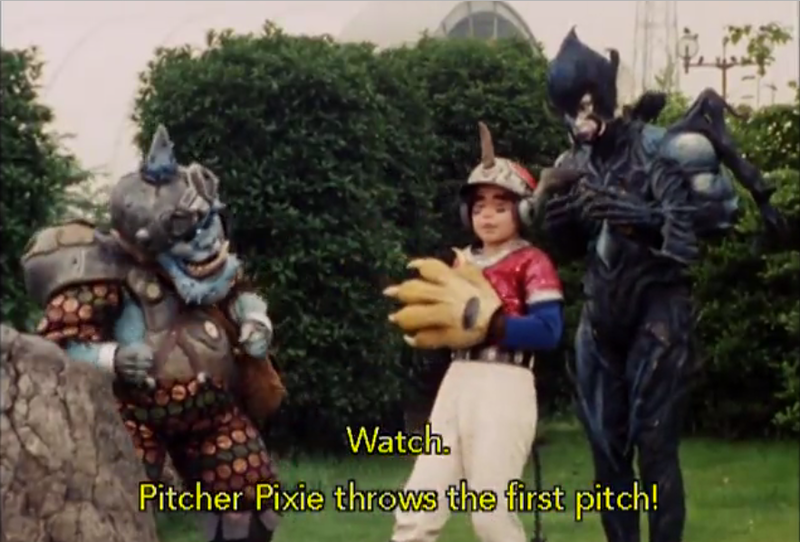 Speaking of which, breaking Dora Pixie’s horn causes him to turn into the giant form that Babe Ruthless is based on. It also turns out that while everyone who had been hit by the little ball of love is now free, the giant Dora Pixie/Babe Ruthless instead has a love-gas that it sprays at people to turn them into mindless worshippers. Among those sprayed is, of course, the Pink Ranger. Without her around, the other Rangers (including the Green one, who comes out of exile) have no other choice but to enter what in North America is called “Dragonzord Battle Mode”, since Pink’s Guardian Beast/Zord is unavailable. 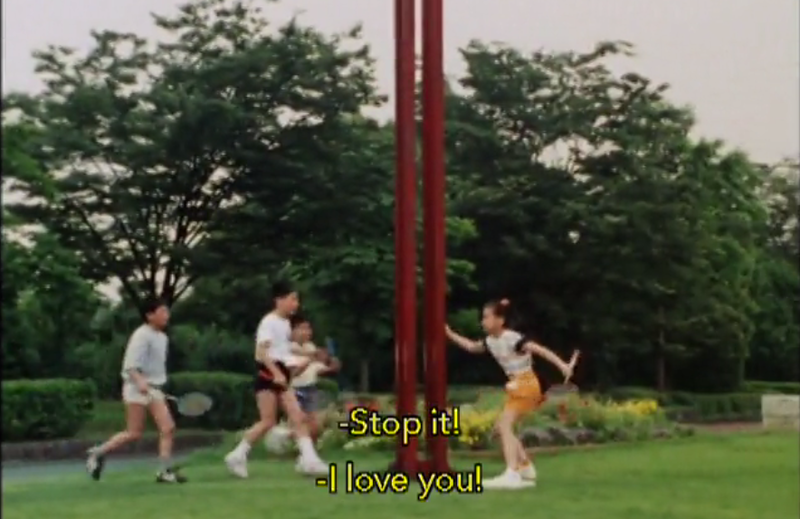 Anyway, from the point on, it is pretty much the Babe Ruthless portion of the Power Rangers episode, only in Japanese. They then tie up the whole story with the kids, and then that is that. 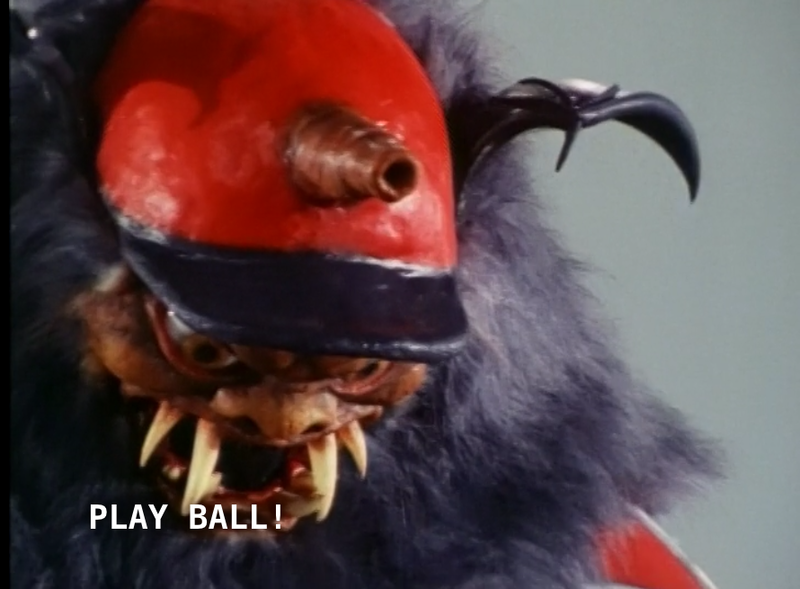 And thus ends Part 1 of our long, strange, trip of a look at the baseball episodes of Power Rangers. Come back next time for Part 2. May the Power protect us. Next Time on Bizarre Baseball Culture: MORE RANGERS. This entry was posted in Baseball, International, Movies, TV and such, Uncategorized and tagged A Star Is Born, Babe Ruthless, baseball, Bizarre Baseball Culture, Dora Pixie, Knuckleball of Affection, Kyōryū Sentai Zyuranger, Mighty Morphin Power Rangers, Power Rangers, Rangers, Sentai, Super Sentai, Zyurangers by danglickman. Bookmark the permalink.